About 10 days ago, I had the privilege of attending Prairie Rail in the Kansas City area for the first time. This operating weekend dates back some 20 years, and is widely sought after because of the many outstanding layouts in the KC area. By increasing the number of sessions on some layouts, the organizers were able to enlarge attendance this year. 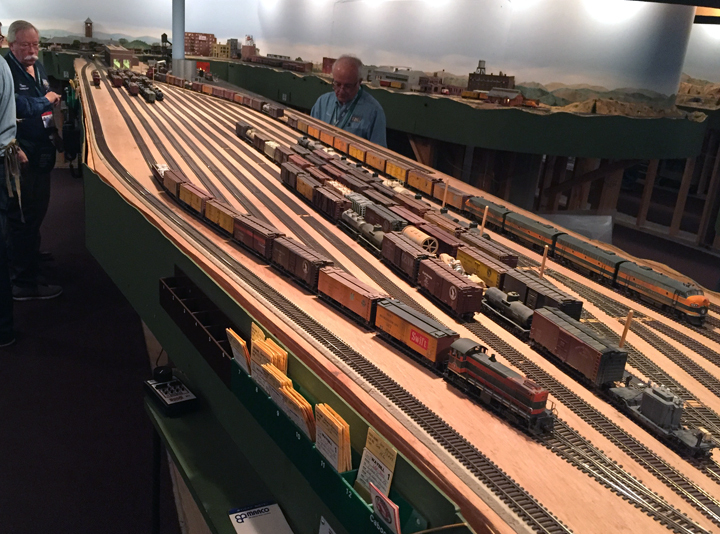 A number of modelers from the San Francisco Bay Area were at Prairie Rail this year. Some of us traveled early in order to enjoy some “pre-event” sessions, privately organized, prior to the start of Prairie Rail itself. Among these, an outstanding layout was Paul De Luca’s New York Central in Omaha, a large and ambitious project, still being constructed in some parts, but stunning in the areas that are completed. Paul has taken on the challenge of the Central’s four-track main line along the Hudson River, and it is great fun to run trains on that segment, or simply to railfan the passing trains. Everything I saw ran perfectly. One photograph can’t do it justice, but here is a representative view. I really enjoyed the chance to see and operate on this layout. We saw some other layouts in the “pre-event session,” I was assigned four layouts in the main KC program, and there were open-house visits on the last day of the event. I don’t want to take space to discuss and show all of the ten layouts in total that I had the chance to visit, but will show a few highlights. One of the most impressive layouts in that area is John Breau’s Great Northern in Montana. In addition to being a very large and beautifully finished layout, it has many superb scenes. I will show just one, representing one of the “elevator towns” in eastern Montana, where the whole economy revolves around grain growing. Switching here is a little complicated! I found this area, just one of many on the layout, truly stunning. My assignment in this session was as one of the yard crew at Great Falls, the major yard on the layout. This was a truly busy and fast-paced job, and it kept me working as steadily and as rapidly as I can remember almost anywhere. This photo conveys a sense of the sheer size of the yard. At far left is Travers Stavac, who shared the yard duties with me. My yard engine is in the foreground, and it was rarely idle, classifying inbound cars delivered by passing trains, into some twelve tracks. 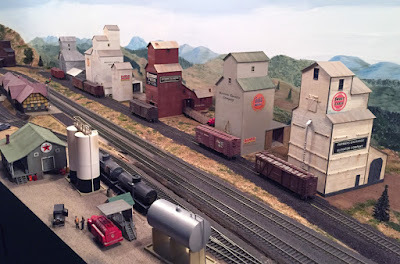 Another layout I really enjoyed was Matt Steenwyk’s Milwaukee Beer Line, modeling much of the entire Beer Line branch, not just the short segment familiar from the Model Railroader project layout. One job I did there was the Gibson Yard job, not only sorting cars in the yard but also switching local industries. The most challenging and fun part was the “Snake Track” area, where every move had to be carefully planned. At left below is T.J. Stratton, my conductor, as we worked on this part of the job. This layout is well planned and much of it is complete, really an excellent operating experience for all who got a chance to work there. I also operated on Don Ball’s superb Stockton & Copperopolis layout. What a joy to see the modeling and to operate the equipment. This layout was just featured in Model Railroad Hobbyist (issue for March 2018), so I won’t go into detail here. 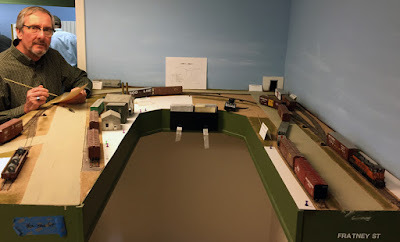 Some of the layout features, though, were too good not to describe, and probably I will add a second post at some point, so I can say a little more about Don’s fine work. There were also layout open houses, excellent opportunities to see the layouts you didn’t get to operate on. One of the most impressive was Michael Borkon’s Union Pacific in Wyoming. One of its fine features is the use of actual photographs of the various areas, serving as realistic backdrops in this dramatic topography. For example, shown below is the engine terminal at Green River, Wyoming, with photos of the actual scenery as backdrop. A great idea and well realized. This entire weekend was very well organized and smoothly run, and the layout quality is just off the charts. I really enjoyed the chance to be part of this impressive event. The title quotes the question I’m often asked, usually by non-Californians. And many times, when I’ve mentioned coal loads on my layout (that is set on the Central California coast in 1953), I get expressions ranging from amusement to incredulity. Now of course, some of that response is quite sensible. California is not a coal state. Very, very little coal was ever mined in California, and most of it was terrible quality, disappointingly high-ash coal (lower BTU, more ashes to clean up). So the traditional kind of railroad coal traffic, outbound loads from coal mines, was indeed all but non-existent in California by 1953. But the other end of coal traffic, coal arriving to consumers, is another story altogether. Coal did arrive from several places outside California, and was used primarily in industrial settings. The biggest user of this coal was the Kaiser steel mill at Fontana in southern California. Most arriving coal in California came from the coal fields in eastern Utah/western Colorado. Carriers were D&RGW, UP, and the Utah Coal Route. For years, this traffic moved predominantly in GS gondolas. In 1952, D&RGW began to buy conventional 70-ton triple hoppers, and I can model those in addition to the GS gons. 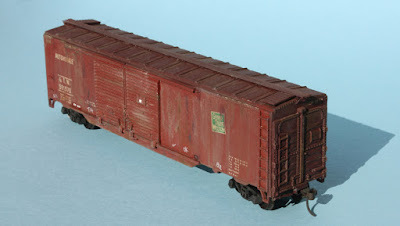 Here is an example on my layout, using an old Roundhouse offset-side model for the hopper. But any knowledgeable D&RGW modeler will realize at once that this is a stand-in model at best. The only Rio Grande offset-side hoppers I know of were ballast cars, with longitudinal-dump doors. 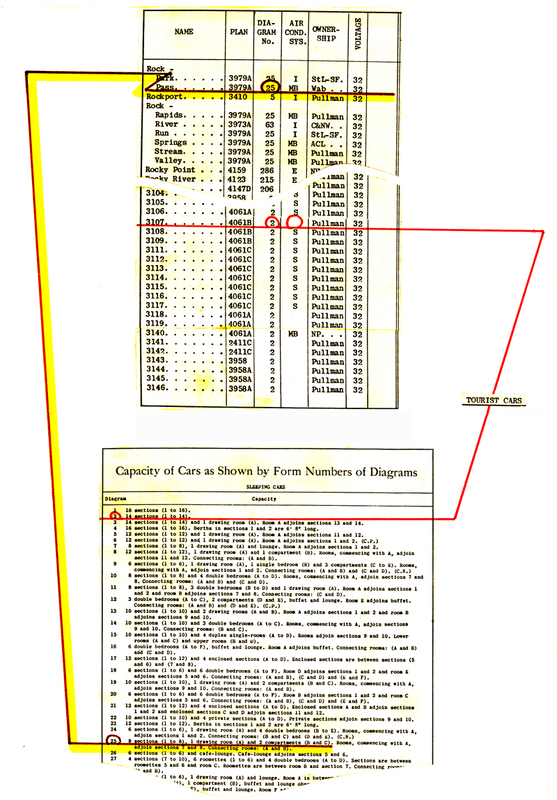 The number series of the Roundhouse models, 17000–17199, would represents car built in 1957, although Roundhouse has lettered the model with a 10-48 built date, an entirely imaginary data item. Moreover, the 1957 cars were not offset-side cars. I will eventually replace this model, but it serves for now as an alternative to the familiar GS gondolas in D&RGW coal service. Those D&RGW gondolas have long been a modeling challenge, because instead of the very common 40-foot length of such cars on nearly all railroads, D&RGW built most of them 46 feet long. In addition, most of the cars also had distinctive side sheets and trucks. 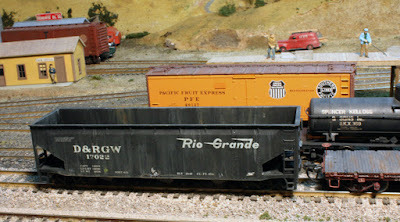 This challenge was met by W&R Enterprises with a brass model, including the right trucks, and I do use one of these cars as part of my coal traffic. It’s shown below. The Utah-Colorado coal fields are not the whole story of California coal traffic. There are very interesting published accounts relating to California coal and coke use during miners’ strikes in Utah/Colorado, with coal coming from the southern Illinois coal fields and even from as far away as the Pennsylvania/West Virginia/Virginia area. I will probably model this by occasionally operating C&O or WM or N&W hoppers which are in my fleet; all three roads did have substantial off-road customers for coal, much of it marketed through fuel brokers. 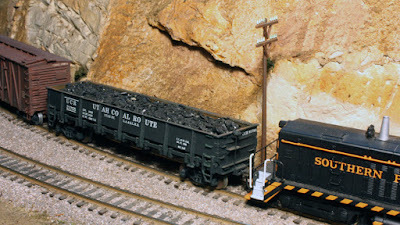 As I have indicated in previous posts, one important destination for coal on my layout is the facilities of the Southern Pacific itself (this is discussed here: http://modelingthesp.blogspot.com/2016/06/coal-traffic-on-my-layout.html ). Well into the 1950s, SP still relied on coal for fuel in section houses, depots, roundhouses and other on-line structures, as well as for use in caboose stoves. Accordingly, I will model some coal deliveries. This is the other part of the traffic discussed in the post on my plan for hopper cars ( http://modelingthesp.blogspot.com/2011/03/choosing-model-car-fleet-7-hoppers.html ). So my coal deliveries are primarily in GS gondolas, and one interesting example is one of the old Ulrich white-metal models, lettered for the Utah Coal Route (a joint operation of the Utah Railway and the Los Angeles & Salt Lake subsidiary of Union Pacific). This model does not accurately model the prototype, but is similar in appearance. It’s shown here during a run-around move at Shumala on my layout, fully loaded with coal. This is my background for a certain amount of coal traffic on my layout, even though the layout is set in coastal California. It’s a far cry from Appalachian railroading, but it suits my locale. 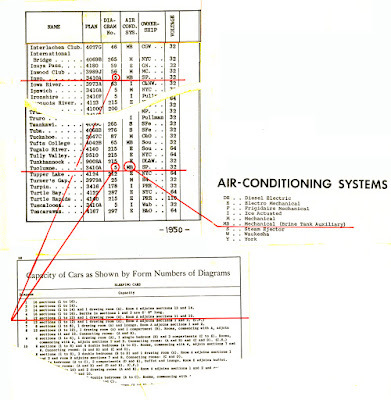 In previous posts in this series, I have discussed prototype auto traffic; prototype equipment that was inside automobile cars; sources and destinations of auto parts traffic; and routing issues. 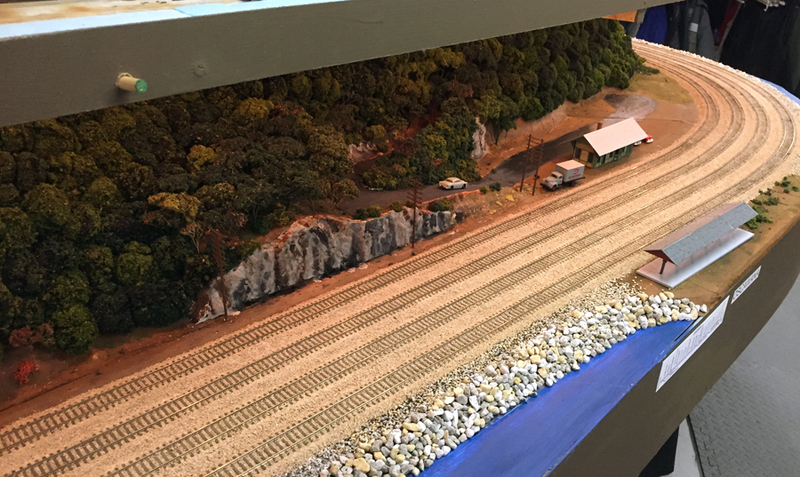 I have also shown a number of the model cars in my own fleet, aimed at representing auto industry traffic on my segment of the Southern Pacific Coast Route. All can readily be found by using the search term “auto industry” in the search box at right. The present post pretty much wraps up this topic, with a few additional model cars to show, and some further information about uses of automobile cars. First, some models. I have a fair fraction of 40-foot automobile cars in my fleet, though I realize many modelers think only of 50-foot double-door cars as automobile cars. But of course that is not really true; data such as shown in Part 5 of this series amply demonstrates the point (that post can be seen at: http://modelingthesp.blogspot.com/2018/01/auto-industry-traffic-part-5.html ). For some of the roads shown in the Part 5 chart, the 40-foot car was more numerous than the 50-foot car. Shown below is an example of such a 40-foot car, a Santa Fe Class FE-19 rebuild, modeled originally by Richard Hendrickson, starting from an Athearn Blue Box car but of course with numerous changes and upgrades. The white door stripe shows that it is AAR Class XMR. Next is a Cotton Belt car, also 40 feet long. This is the kind of car that would have showed up in Cotton Belt’s hot freight train, the “Motor Special,” though this train primarily served the Southwest, not California. This particular model was built from a Sunshine kit for the SSW 46000-series cars, rebuilt in 1937 from USRA-clone box cars originally built in 1924. 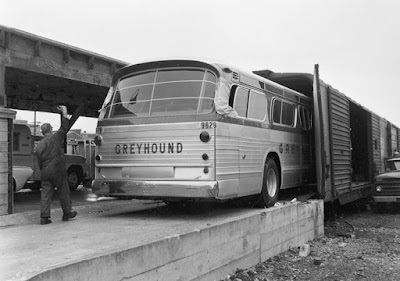 In the previous post, I showed a photo of a Greyhound bus being unloaded from an automobile car with end doors, showing how big a load could be included in such cars. There are other examples of vehicles larger than automobiles in these cars. 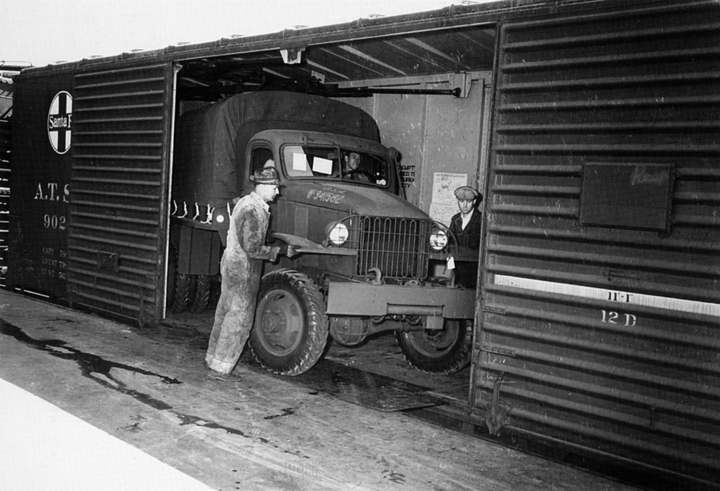 Shown below is an Army truck being loaded into an automobile car during World War II production in 1942, at the GM assembly plant in Oakland, California. The Santa Fe car is part of Class FE-20 with auto racks, which have been folded up against the ceiling and secured, just visible above the truck (photo from the John Signor collection). Note the white door stripe. As I have indicated elsewhere, automobile cars were used for other bulky loads, especially when they could be loaded through side doors. One example, shown below from a prior post, is an Aeronca airplane, with wings and tail planes removed, being loaded into a PRR auto car, and you can vividly see the width of the door opening (that post is at this link: http://modelingthesp.blogspot.com/2015/12/delivering-loads-from-automobile-cars.html ). The truck is lettered for the Aeronca Corporation, located in Middletown, Ohio. Though Aeronca ceased airplane production in 1951 (I model 1953), it continued to produce aircraft parts for others, and also continued to repair, refurbish and resell older Aeronca airplanes. This plane being loaded may be one of the latter. Automobile cars were also commonly used for lumber traffic, again on account of the wide side door openings that made loading and unloading somewhat easier. A good photo of that, showing typical board-by-board unloading, is shown below, from the excellent Million and Paton book about the Pere Marquette (more about the book, and a full citation, is in a previous post: http://modelingthesp.blogspot.com/2018/01/auto-industry-traffic-part-6.html ). The photo, circa 1940, is from the C&O Historical Society collection. This largely wraps up the topic of not only automobile industry traffic, but also the breadth of uses of prototype automobile cars. They were not just for set-up automobiles, nor even auto parts traffic, but had many other uses. On my layout, I attempt with waybills to reflect the breadth of those uses. In the previous two parts, I showed a simple way to approximate HVAC (Heating, Ventilation, Air Conditioning) enclosures with pieces of diesel shells (see: http://modelingthesp.blogspot.com/2017/12/hows-your-hvac-part-2.html ). But as correctly noted in comments to the post just cited, in my modeling era (early 1950s), building air conditioning was not yet common. Simple ventilators would have dominated most rooftops. You can see listed all the different parts, 37 items in all (you can click on the image to enlarge it). Most are ventilators, and only a few are really HVAC enclosures. The set comes with just one of each of the larger items, but there are multiple examples of most of the ventilators. This shows one of each of the kit items (the building itself, of course, is not supplied). 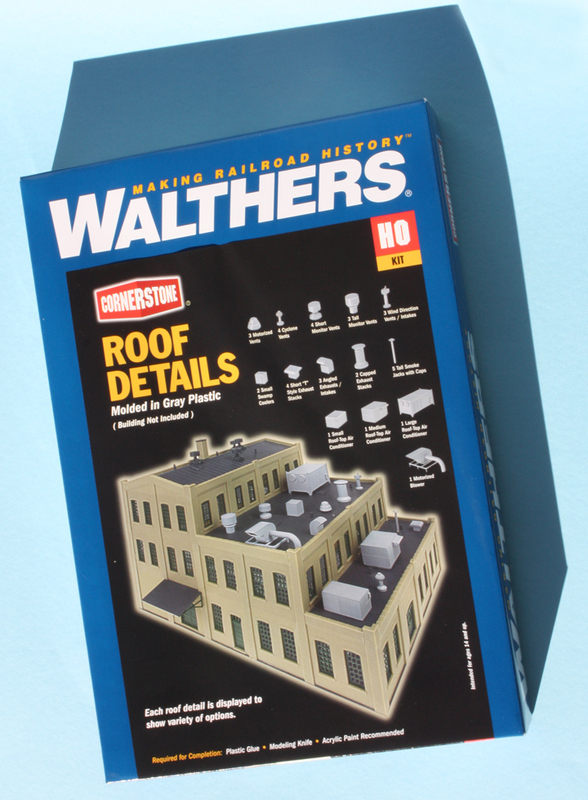 Incidentally, note that with this set, as with any Walthers structure kit, there are PDF copies of the instruction on line. You can just Google something like “Walthers 3733” (the number of this kit) and the instruction sheet will come up promptly. This can give you an advance idea of how the parts assemble. Recognizing that in my modeling era (1953), ventilators were much more common than building air conditioning, I assembled several of the ventilators in this Walthers set. You can see some of the styles in the photo above. My only comment about assembling these is that the sprue design is such that even careful use of a sprue cutter will still leave small scars and protrusions on the parts, but a few strokes with a fine-toothed file readily removes them. Shown below are six of the eight styles of ventilators and intake/exhaust parts (there are more of each style on the sprue, just not yet assembled by me). These are right from the sprue, so they still need a coat of flat finish and some weathering. I’m pleased with these Walthers parts, and will build more of the ventilators. This is a big set, and a good thing, too — it’s surprising how fast they disappear when you start “improving” the roofs of various buildings! 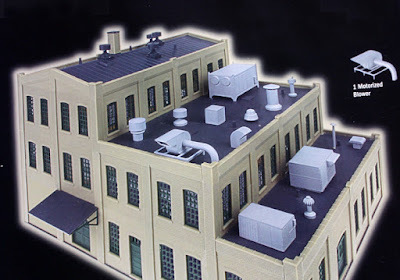 And though I don’t think I want to place any of the air conditioning units from this set on my 1953 buildings, they may make good loads for flat cars and gondolas. After all, in 1953 air conditioning was the coming thing! In the previous two posts about Pullman heavyweight sleepers, I described m goals in making the particular car choices for modeling, and (in the first post) gave complete citations to my prior, more detailed modeling posts, as well as to the complete Mainline Modeler magazine article series. The previous post, Part 2 (see it at: http://modelingthesp.blogspot.com/2018/02/my-pullman-projects-part-2.html ) has a link to Part 1. I wanted to do one more distinctive body style, the 10-1-1 (10 sections, 1 drawing room, 1 compartment), and SP did own such cars. 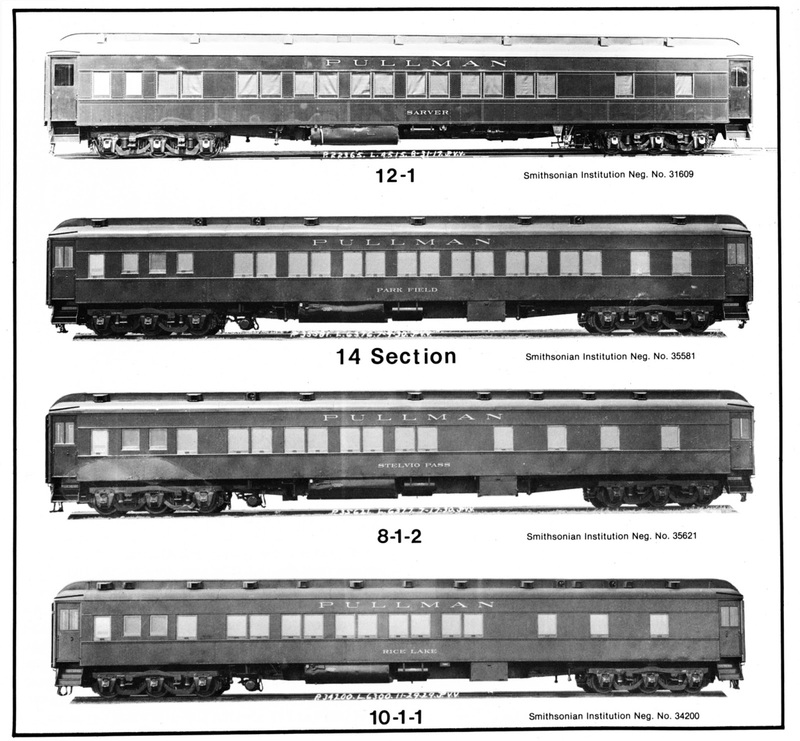 That the four car types presented in this Mainline series are all different (the 12-1, 8-1-2, 10-1-1, and 14-section) is shown by this comparison of broadside photos from the Mainline series. Whether you count the paired windows of the sections (following the hint I gave near the end of the previous post), or look at the aisle windows at the right end of each photo, you can see how different these cars are in their appearance. 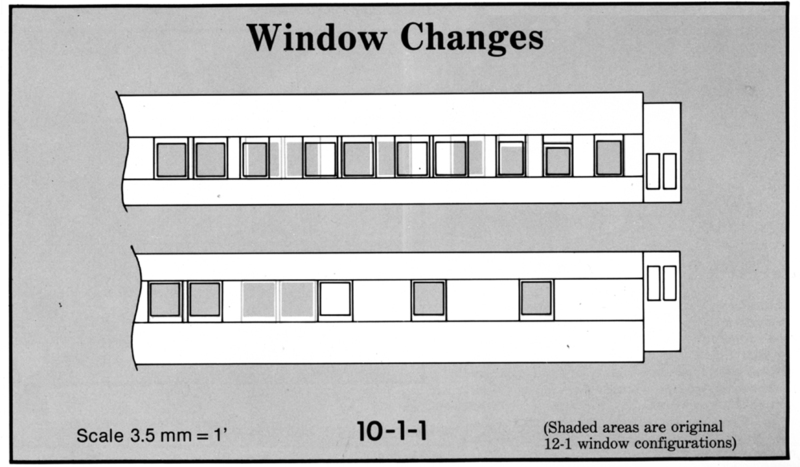 As with the other car types described in the Mainline series, there was a very helpful drawing showing the windows that had to be moved (or replaced), what type of window, and where they would go. The example below shows the style. I found this very easy to use. The idea here is that the shaded windows are the original locations, and the outlined windows are what should be there when the work is completed. Good way of presenting this information. When done with the body of the model (described more fully in a post in my earlier series, namely this one: http://modelingthesp.blogspot.com/2014/07/modeling-sp-passenger-cars-sleepers.html ), I had to decide on paint and lettering. 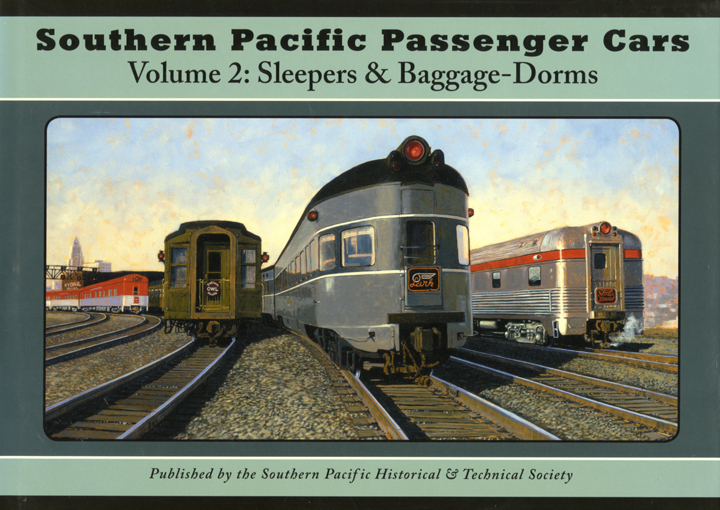 Here I drew upon a superb source of information for the Southern Pacific passenger car modeler, the series published by the SP Historical & Technical Society, entitled Southern Pacific Passenger Cars, in six volumes. For the present task, I consulted Volume 2 on sleeping cars. This book can be found at better hobby shops, or direct from the Society at its website, https://sphts.myshopify.com/collections/all?page=2 . 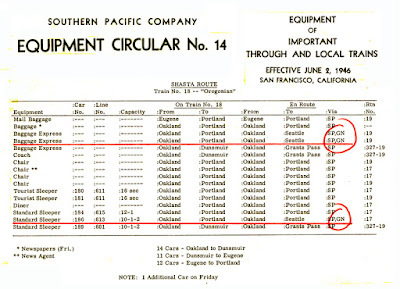 Among other things, this reference tells us (Chapter 3) that the most numerous Pullman heavyweights purchased by SP were the 10-1-2 type (not addressed in the Mainline Modeler articles), closely followed by the 12-1 type (the latter car type was the subject of my first post in this Pullman series: http://modelingthesp.blogspot.com/2018/02/my-pullman-projects.html ). Incidentally, if you can’t find or don’t want to find the series of Mainline magazine issues, the entire Hoff series was reprinted in the “Best of Mainline Modeler” book, Passenger Cars, Volume 1 (Phoenix Publishing 1991). We also learn in the SPH&TS Volume 2 that SP only purchased two cars of the 10-1-1 configuration, and by 1953, only one of them was painted Dark Olive Green. That made my name selection for my 10-1-1 model was very simple: Palouse Falls, as I discussed in my more complete description of the model work (see it at: http://modelingthesp.blogspot.com/2014/07/modeling-sp-passenger-cars-sleepers.html ). Here’s the completed car. With this model, my basic SP heavyweight and Pullman fleet is almost done. 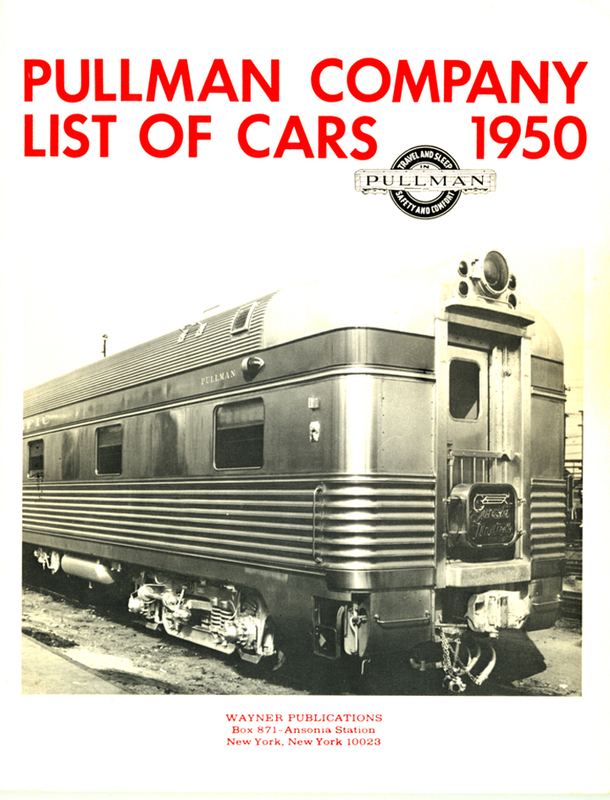 But what about those numerous 10-1-2 cars that SP bought from Pullman in 1949? Making one by converting from a Rivarossi 12-1 is pretty complicated (as mentioned in the Hoff and Zenk article, Part 4 of the Mainline Modeler series, July/August 1981). I decided I didn’t want to go that far, even though the 10-1-2 is a car type I would like to operate. As of now, I am holding a Branchline kit for one of the SP cars of that type, Lake Sheridan, and will get it built and into the fleet one of these days. Another point to consider is that Pullman sleepers owned by roads other than SP did operate over SP lines at times. Including such cars seems an interesting opportunity. More later. There have now been several posts in this thread. The previous posts gave links to the preceding ones, if you wish to track back to the beginning; or you can use “auto industry” as a search term in the search box to the right. In particular, here is a link to Part 5, which contains links to the posts before that: http://modelingthesp.blogspot.com/2018/01/auto-industry-traffic-part-5.html , and in addition the following post brings many parts of the topics a little further (see it at: http://modelingthesp.blogspot.com/2018/01/auto-industry-traffic-part-6.html ). This model was built and weathered by Richard; I have one of his door moldings and have a partly completed additional car on my workbench. One other player of importance in auto industry traffic was the Pennsylvania, serving not only parts of Michigan but areas of the upper Midwest where many auto parts were produced. 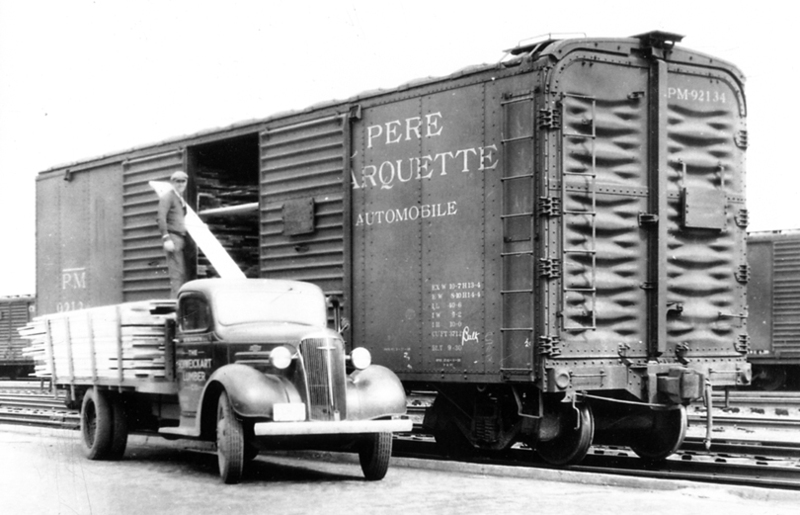 Accordingly it is essential to include PRR automobile cars in any transition-era fleet. Both the cars I have are AAR Class XM and would have been in auto parts service at least at some times, and both are distinctively Pennsy round-roof cars. One of them is a 50-foot car, PRR 58845, PRR Class X32a (it is a brass model from Rail Works Limited). Next is a model of an X31c car, PRR 60825, in the form of a brass import by W&R Enterprises. This one was painted and weathered by Richard Hendrickson; note that the car formerly had auto racks, but these had been removed (as verified by the Official Railway Equipment Register) in the late 1940s, and the white stripe on the right hand door has been painted out. You can click on the image to enlarge it, if you wish. The car is very appropriately weathered to the state you see, typical of the PRR in the 1940s and 1950s. It is important to realize that double-door automobile cars, especially those with end doors, found additional use for much larger vehicles than standard automobiles. This might include heavy trucks, farm equipment, and buses. 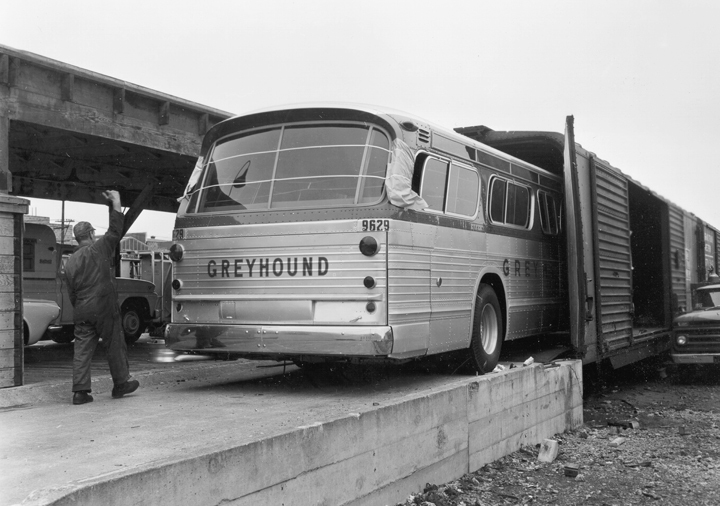 Shown below in a dramatic photo is a Greyhound bus being unloaded at San Francisco in 1965 (Southern Pacific photo, negative N-7435-2, Shasta Division Archives). As is evident, the bus is a close fit. Probably the side doors were opened first to release tie-downs. This photo (and others like it) clearly shows that in thinking about the cargoes carried by automobile cars, it’s important not to think only of automobiles. I continue to work on my layout’s representation of auto industry traffic, because at the time I model (1953) it was a very lucrative traffic, and for that reason was one which the railroads worked hard to serve. I hope I can adequately depict the range of car types and car ownership which fits with my modeled geographic locale and era. In Part 1, I mentioned a series of blog posts from 2014 about developing my fleet of model Pullman heavyweight sleepers, appropriate for my 1953 layout and operating on the Southern Pacific Coast Route (you can see that post at: http://modelingthesp.blogspot.com/2018/02/my-pullman-projects.html ). 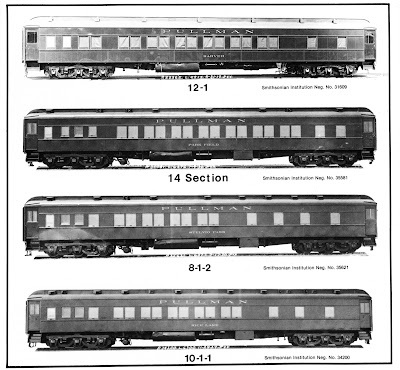 The models I showed in that post, and the data from the Wayner Pullman car list, represented the most common body type, the 12-1 (12 sections, 1 drawing room). But SP also really liked two other floor plans with more rooms, one of which was the 8-1-2 (8 sections, 1 drawing room, 2 compartments). That was among the floor plans described in the Mainline Modeler series from 1981 on modeling Pullmans. 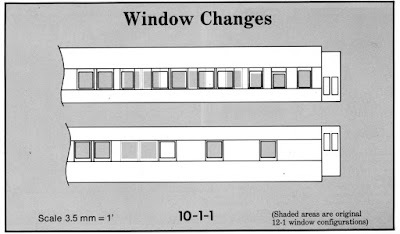 The drawing below shows at a glance how different a 12-1 and an 8-1-2 were inside, and naturally this is reflected in the window arrangements. 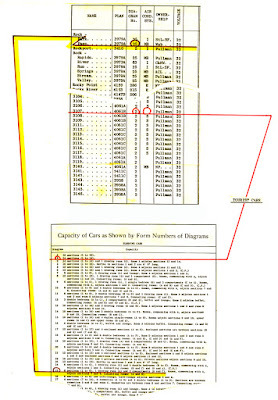 In setting out to model the 8-1-2, the Mainline article clearly showed the changes that needed to be made for this particular car. 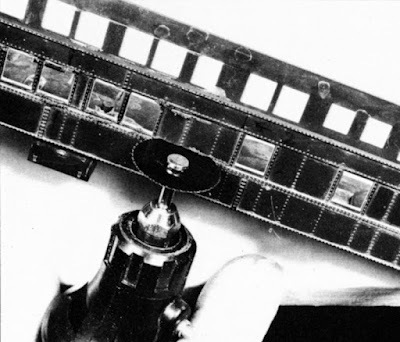 The great insight by series author Thomas C. Hoff is that Pullman heavyweight bodies were essentially identical outside, except for window arrangement. Thus many floor plans can be modeled, just by rearranging the windows. That means removing windows that are in the wrong place, and replacing them (and adjoining panels, if necessary) to get the windows in the right place. The process illustrated by Hoff begins with removing “wrong” windows, shown here with the use of a slitting saw. But this saw isn’t essential. As long as the cuts in this step stay away from the top and bottom sills of the windows, they can be done with any cutting tool that the modeler is comfortable with. Then the rough opening(s) can readily be filed to exact size. As I mentioned earlier, the real challenge here is not to remove too much material. The Rivarossi styrene is quite soft, and cutting and filing is almost too easy. Next, the cutting and filing process is repeated on a sacrifice body, to get new window sections. They are sized as a gentle press fit, then flooded inside with styrene cement. This may sound challenging, but in fact it is amazingly fast and easy. I went ahead and modified a Rivarossi 12-1 body with the 8-1-2 window arrangement, guided by the Hoff articles. The brown and yellow line shows that Rock Pass conformed to diagram 25 and was floor plan 3979A. It also shows that the car was later sold to the Wabash, but I have been unable to confirm when that took place. Some of the railroad purchases from Pullman were delayed in execution, even though a selection had been made. Here’s the completed model, lettered as still owned by Pullman. The red line in the table graphic above is for a particular “tourist” car. Pullman at one time built a substantial number of 14-section and 16-section tourist cars that could be marketed for reduced fares because more passengers were carried. Some were air conditioned, many were not. I decided to model one that was both un-air-conditioned and remained in Pullman ownership, thus could be lettered “Pullman” on the letterboard. It is car 3107 in the listing above, a 14-section car. Hint: any car with sections can readily be enumerated by counting the paired windows along the car center. 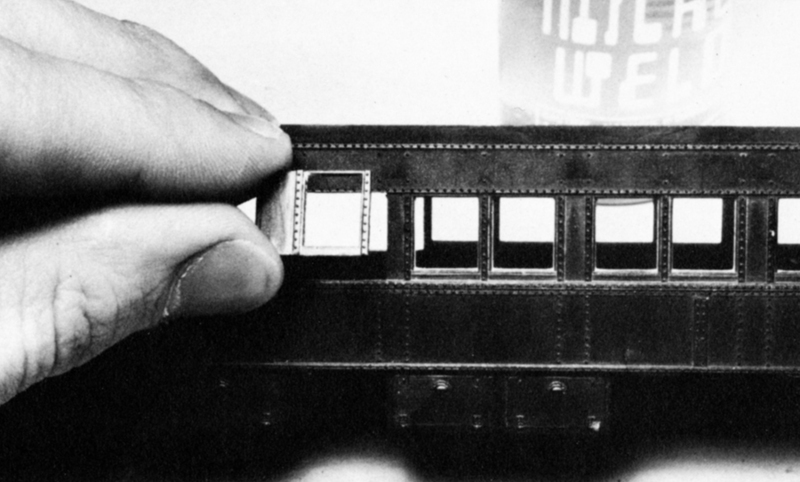 In this 14-section car, there are 7 paired windows (each side), thus 14 sections. Both these cars can operate occasionally in my Coast Route trains. Both are Pullman “overflow” cars but both car types saw extensive service on SP, so are reasonable additions. But this is not the end of my projects on model Pullmans. There are more posts to come. Recently I was discussing heavyweight passenger cars of the Southern Pacific, including Pullman sleeping cars, with a visitor to my layout. I mentioned that I had modified several of the old Rivarossi plastic Pullmans (imported by AHM, or Associated Hobby Manufacturers), following some really good 1981 articles in Mainline Modeler magazine. The modifications were to accomplish other floor plans than the stock model, which is a 12-1 (12 sections, one drawing room). Before summarizing my information sources, and how I used them, let me mention the background from the perspective of my layout. As a first step, I described the basics of the SP’s Coast Route passenger service: http://modelingthesp.blogspot.com/2012/10/choosing-model-sp-passenger-cars.html . This summarizes the things I wanted to accomplish with modeling of Pullmans for passenger service on my layout. These show completion of one of the project cars, and some information about others. Now back to the information and how to use it. The starting point is a Bob Wayner book, simply a reprint of Pullman’s own “live list,” descriptions of all cars in service, whether railroad-owned or Pullman-owned (in 1948, the railroads took over ownership of all lightweight and many heavyweight sleepers; Pullman retained ownership of most of the remainder, for pool service and to support extra movements as needed). Underlined in the top part, from a book page, are SP 12-1 sleepers Inyo and Tuolumne. 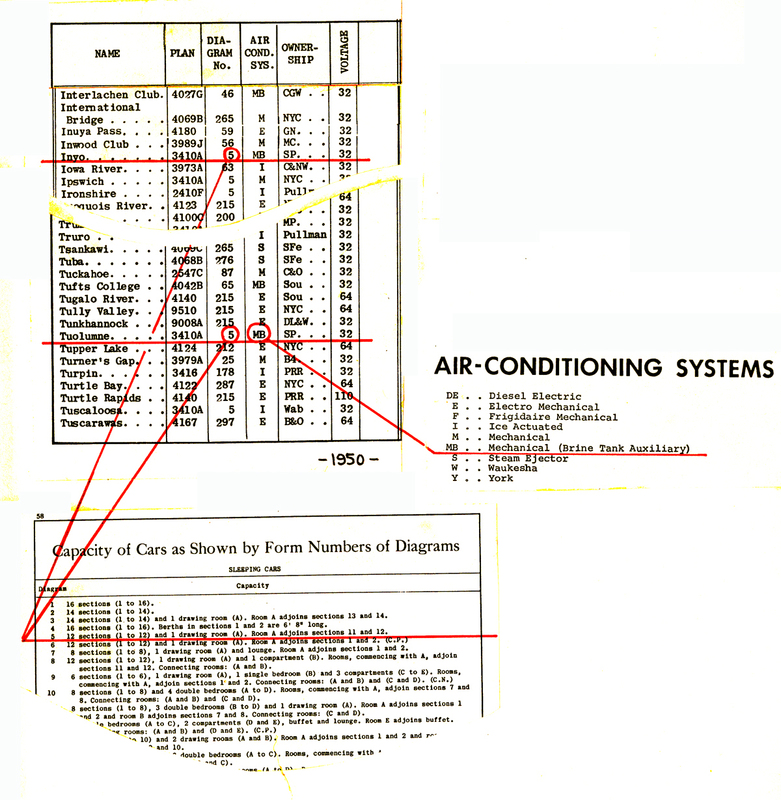 Their air conditioning systems are identified as Mechanical Brine, a detail only essential if you are detailing the underbody, but important in that these particular cars were air conditioned. That means adding roof ducts to your 12-1 model. 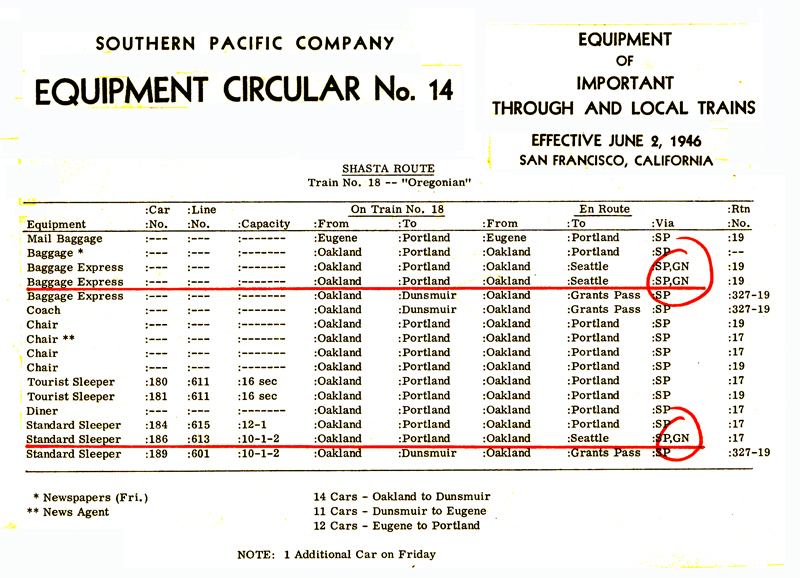 The lower table shows that these 12-1 cars were both “Diagram 5,” meaning Pullman plan 3410A. That’s the common 12-1 floor plan and matches the Rivarossi model. That’s exactly what I did with both cars, which are otherwise pretty stock Rivarossi models, repainted and lettered (I do insert Kadee 33-inch wheels in place of the Rivarossi undersized and overflanged wheels, and adjust coupling to accommodate Kadee couplers (see the Part 5 post, link provided above). Here are both. These cars are the same length, though the one in the back looks shorter at this angle. Even in the 1950s, the 12-1 Pullman was still the dominant type in the fleet of heavyweight sleepers. These two accordingly are, singly or together, in most of my Coast Route trains that include any sleepers. In future posts, I will present the other principal sleepers I have done.